Conforming foam scrubs any surface you need scrubbed! Griot's Garage Ergo Wave Foam Scrubber is a versatile scrubbing foam pad constructed with an open-cell foam that is resistant to tears. Perfect for use on vinyl, plastic, leather, rubber, paint, upholstery, carpet, wheels and more, Griot's Garage Ergo Wave Foam Scrubber can be used on both the interior and exterior of your vehicle – in fact, you can probably find uses for it in the home as well! Griot's Garage Ergo Wave Foam Scrubber will contour to fit any surface that needs scrubbing and three finger holes allow for a firm grip. Step up your scrubbing with Griot's Garage Wave Foam Scrubber! The three-hole design allows you to get a good grip for scrubbing! 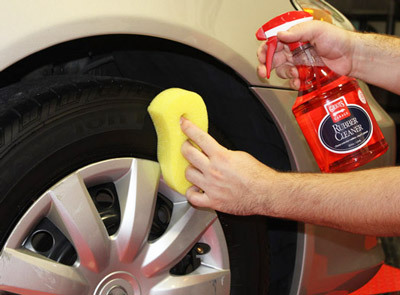 Some areas on and in your vehicle need a little extra attention – like that dried on mud you accidentally smeared into the carpet, or the dried whipped cream from a spilled coffee drink on the door frame. You don't want to use a brush that's too harsh and may cause extra damage, you want something that will scrub away the grime! Griot's Garage Ergo Wave Foam Scrubber will scrub your dirty surface easily and leave no marring behind! Featuring an ergonomic wave shape, the Griot's Garage Wave Foam Scrubber is comfortable to use for extended periods of time, and will hold up extremely well under heavy use. The tough open-cell construction is tear-resistant while still being gentle enough for delicate surfaces, such as leather. Use Griot's Garage Ergo Wave Foam Scrubber with Griot's Garage Interior Detailer for heavily soiled interior panels, or even with Griot's Garage Engine Cleaner to scrub away crud on your engine. The all-purpose Griot's Garage Ergo Wave Foam Scrubber will soon become a cherished tool in your detail supply! Griot’s Garage Ergo Wave Foam Scrubber measures 6 ¼ x 3 ¼ x 1.